$195. Vintage Co-op gasoline globe top petroleum collectible, c. 1960s. Plastic top in a shield shape with yellow and red face. 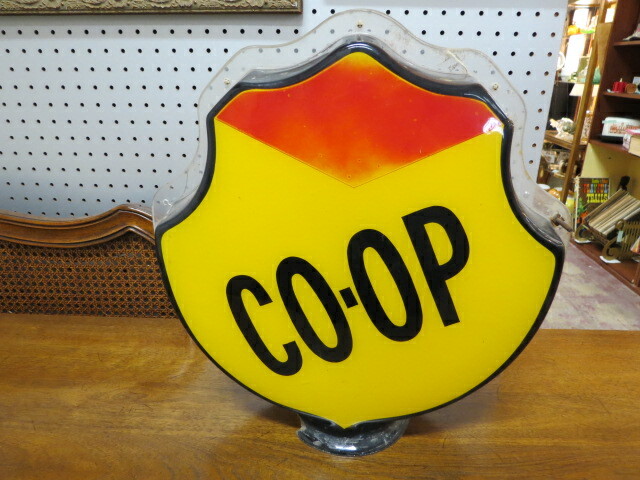 Co-op was a prominent gas company in the 20th century. Black Co-op letters and black sides. Has a crack in the side and a piece of clear plastic missing where the 2 faces connect. Add this to your collection. 16in wide, 6in deep, 17in tall.